So we are in the process of moving to a new house. A new house is fun and exciting, moving on the other hand is not. My husband has already informed me that my scrap pile will not be coming with us, so that means I need to use it before I lose it. I don't remember where it came from, but I had a length of 2" wood dowel sitting on a shelf. 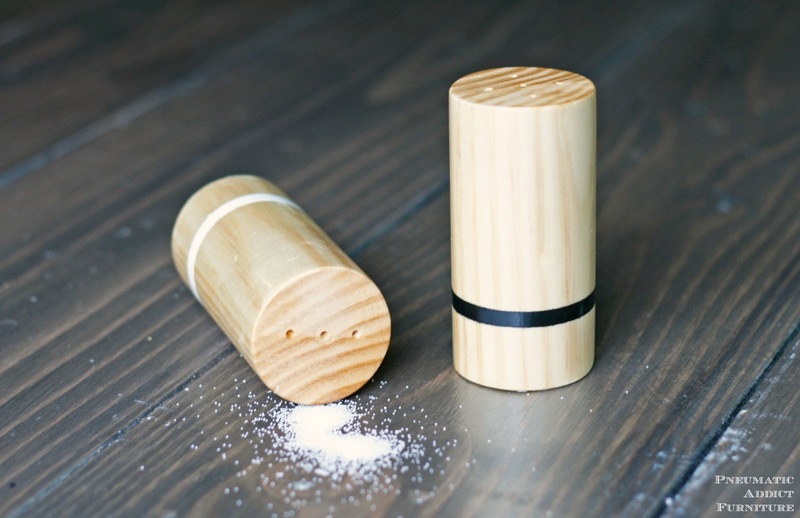 I decided I could makes some pretty sweet salt and pepper shakers, so that's what I did. 1. 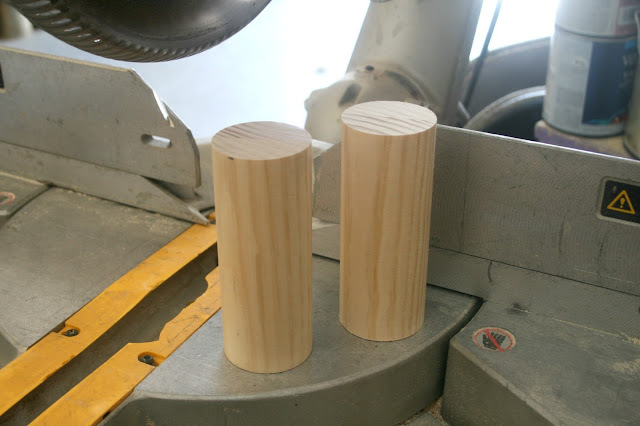 The first step was to cut two, 4" lengths of dowel. 2. To create the hollow area I pulled out a 35 mm forstner bit. If you have ever installed euro-style or cup hinges, you have one of these drill bits. They come in the *hinge jig and bit kit that you use to install cup hinges to a cabinet door. If you can find one with an extra long shank, even better. 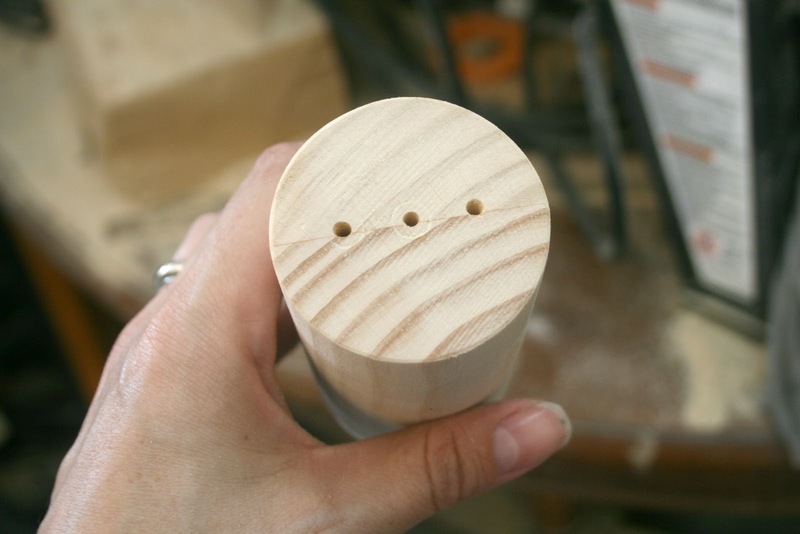 Mark center on one end of the dowel. Secure the dowel in a vise clamp if using a drill press or to a stable work surface if drilling by hand. Slowly start drilling and removing material. 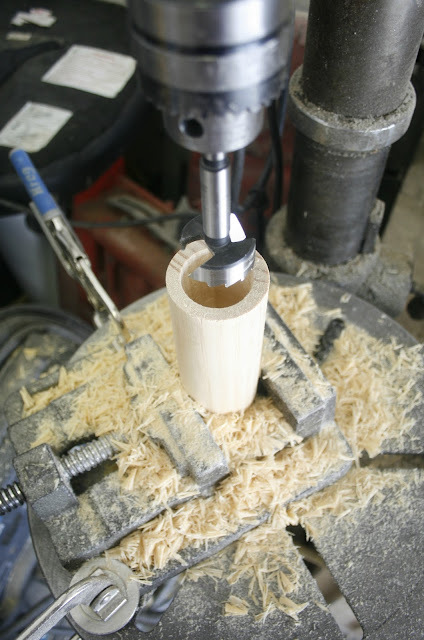 Periodically lift up the drill bit from the hole to remove shavings. 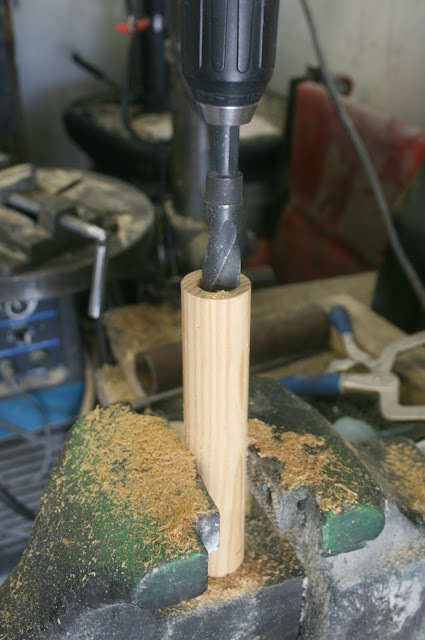 Drill a hole as deep as possible, without punching through the other end. With my drill bit, I was able to drill about 3 1/2" deep. 3. On the reverse end of the dowel, find the center and using a 1/16" drill bit, drill your shaker holes. For salt, I made 3 holes and for pepper I made 5. 4. 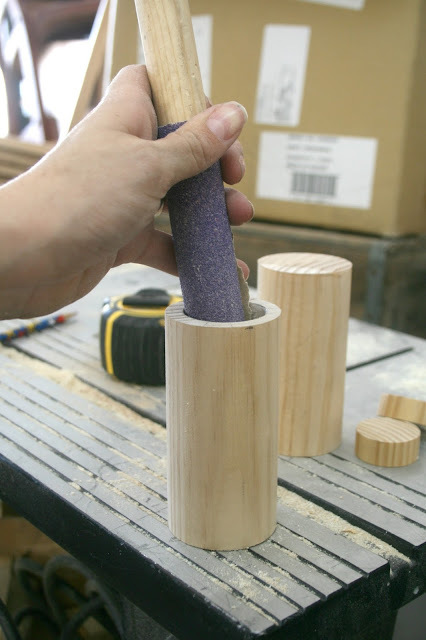 Now you want to sand the dowel inside and out. You don't want shake sawdust onto your food. An easy way to sand the inside of the opening is to wrap a spare dowel, rod, or stick with sandpaper and rub it all along the cavity. 5. Now you need to seal the bottom of the cavity. The nice thing about the 35mm opening is that it perfectly fits the diameter of a wooden curtain rod. If you don't have any curtain rod laying around, Home Depot sells it for something like $0.75/ft in the moulding section. Once again, find the center of the rod. 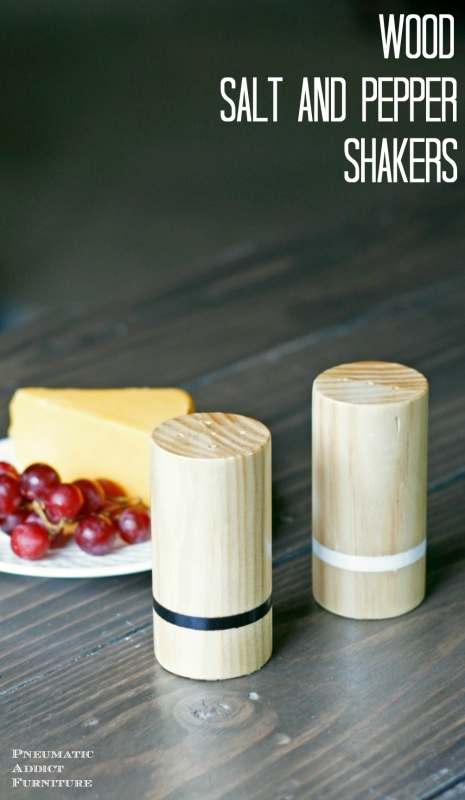 You need a hole large enough to be able to fill the shakers. I decided on a 3/4" diameter hole which was probably overkill. You could probably get away with 1/2" diameter. If you have a forstner bit the correct size, go ahead and drill a hole about 1" deep, otherwise, drill a pilot hole with a small bit and work your way up though larger drill bits till you reach your desired diameter. 6. Next, carefully cut a slice of the curtain rod about 3/4" long. Kinda like a tiny wooden doughnut. 7. Find yourself a cork that fits the hole and leaves a bit sticking out for you to grab. 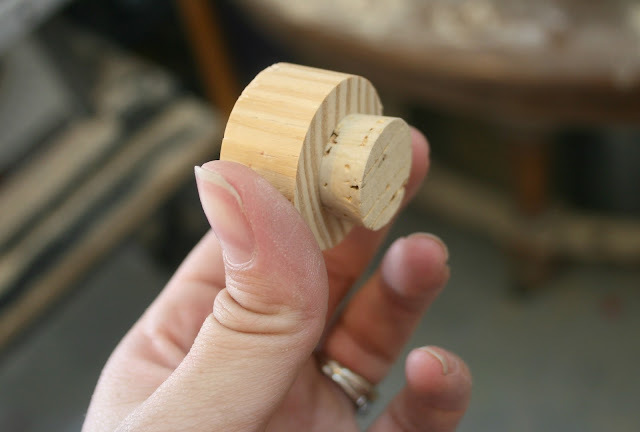 Ace and True Value hardware stores carry individual corks in a range of sizes. I picked out a 7/8" cork to fit in my 3/4" diameter hole for $0.70. 8. 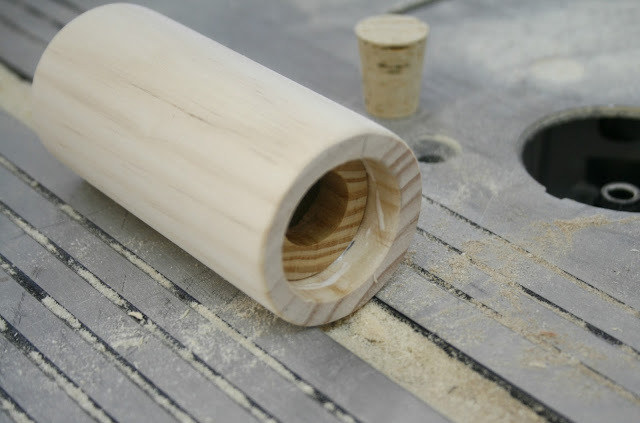 Brush glue evenly around the outside of the doughnut ring and slide it into the opening of the dowel cavity. 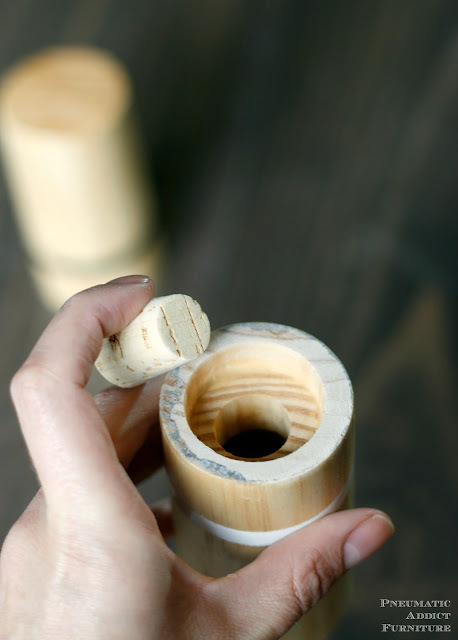 Push it in just deep enough so the cork will be barely recessed from the bottom edge once snug. 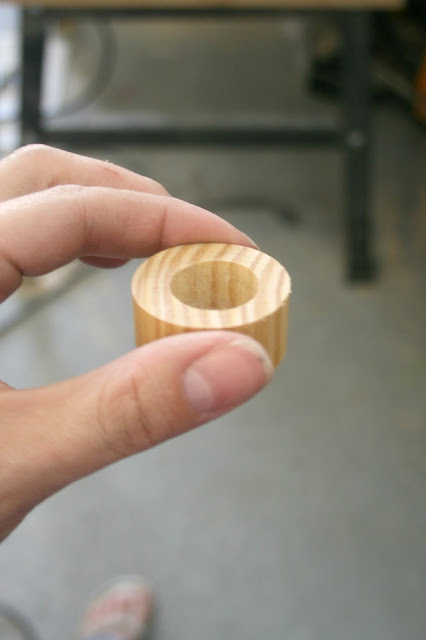 If you can see any spaces where the ring doesn't fill the cavity, fill the space with some extra glue. You may want to run a small bead of glue around the perimeter of the ring, just to make sure there are no gaps. 9. 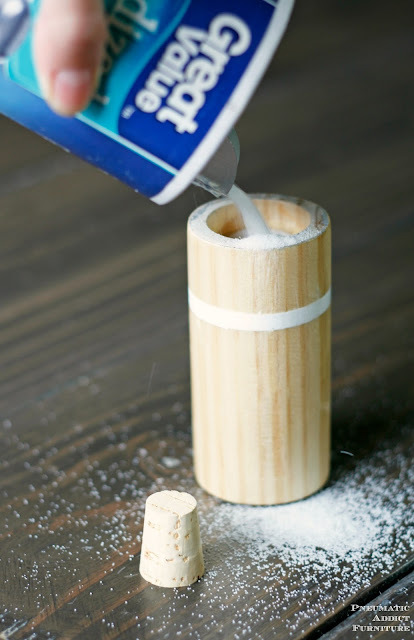 After allowing the glue to dry for several hours, you can go ahead and finish your shakers however you'd like. I painted a white stripe around the salt shaker and a black around the pepper shaker for quick identification. Then, I sealed them both with a few coats of *wipe-on polyurethane and gave them a hand buff for a perfect shine. All that is left is to fill them up and take them for a test shake. And here's my final products. What do you think? Thanks to the hand buff, they feel as smooth as butter and I think they look pretty good too. 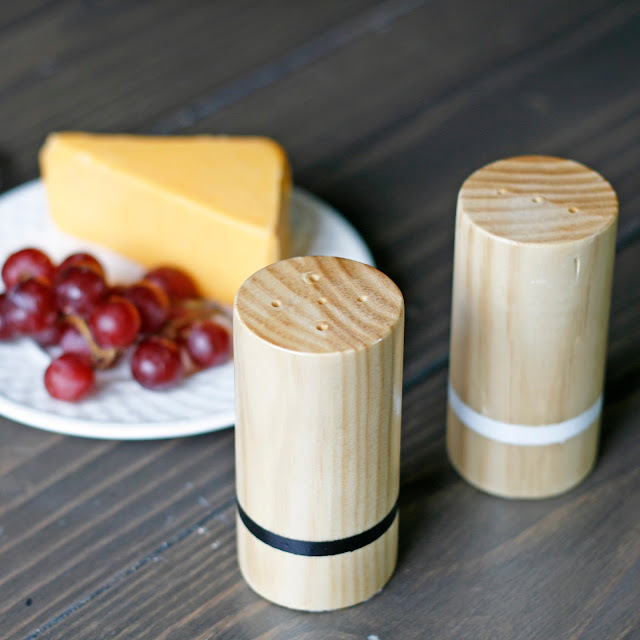 I've never had salt and pepper shakers attractive enough to leave on the counter, but now I have this pair proudly sitting next to my stove. Oops. Looks like I need to throw some salt over my shoulder. And to any of my family or friends reading this, around Christmas time pretend you didn't see this post. I may or may not have come up with everyone's gift idea. If you like this project idea, feel free to pin the image below. Wow, I'm impressed, they are so nice!